Paul Bunje actually spent most of this past year spent in Munich, Germany doing research into the phylogeography and evolutionary history of a genus of European freshwater snails. Based at the Zoologische Staatssammlung München, Paul was able to travel to such places as Ukraine, Hungary, Italy, Austria, Israel, and throughout Germany to collect different populations and species of the genus Theodoxus. The pattern of population-level integration among these living snails will continue to be analyzed in the Molecular Phylogenetics Laboratory of UCMP. These patterns, along with analysis of fossil populations from Israel and phylogenetic data, should help to shed light on the patterns of gene flow, which influence diversification of both species and their morphologies. Kevin Padian spent the first five weeks of the summer in Paris as an Invited Professor in the College de France, giving a series of lectures on Paleontology, Evolution, and the History of Science. This also provided him the opportunity to work on manuscripts with French colleagues, Armand de Ricqlès and Philippe Taquet, on the histology of Triassic archosaurs and on the earliest reconstruction of a pterosaur. Kevin also spent a month in Germany at the Staatliches Museum fur Naturkunde in Stuttgart, working with Rupert Wild on Early Jurassic pterosaurs. 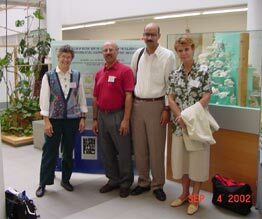 Mary McGann (left), Lipps Lab, with other attendees at the September ISEMMM conference in Vienna, Austria. and presented the conference wrap-up as well as a talk about microfossil evidence (forams and isotopes) of the Medieval Warm Period in estuarine deposits of San Francisco Bay. The next congress will be held in Turkey in 2006. For many, writer Nell Murbargers assessment of Nevadas Smoke Creek Desert as a terrible vastness, lonely and barren and as dry as mummy dust, describes much of the state. However, a group of forest biologists and a couple of paleobotanists see Nevada differently. In the past, Nevada had numerous large lakes teeming with fish and surrounded by diverse conifer-hardwood forests rivaling those of the eastern U.S.big trees and yes, lots of shade.